Growing populations, water scarcity, and regulatory compliance are just a few of the challenges facing municipalities. Ecosphere Technologies leverages its portfolio of patented, innovative water treatment technologies to improve the effectiveness of municipal water management programs, while moving them away from a reliance on chemicals. Our patented Ozonix® water treatment technology provides Municipal water authorities with a non-chemical method for biological and anaerobic treatment, scale and corrosion control, grey and black wastewater treatment, and odor control. Full compliance with local and national regulation requirements for the treatment and disposal of municipal wastewaters is Ecosphere’s number one priority. 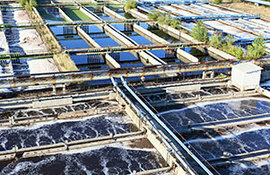 Municipal sewage can be a major source of water pollution, posing a threat to both human health and aquatic environments. Despite this, municipalities around the world continue to discharge raw sewage into local surface waters. Ecosphere’s proven, chemical-free Ozonix® technology can help municipalities cost-effectively treat wastewater and sewage to produce environmentally safe effluent that is suitable for discharge. The greatest challenges for municipalities in terms of providing clean drinking water come in the form of regulation and capacity limitations. Ecosphere’s portfolio of chemical-free water treatment technologies help public utilities minimize operating costs, maximize output, and meet environmental requirements. Become a licensed technology provider to public utilities.